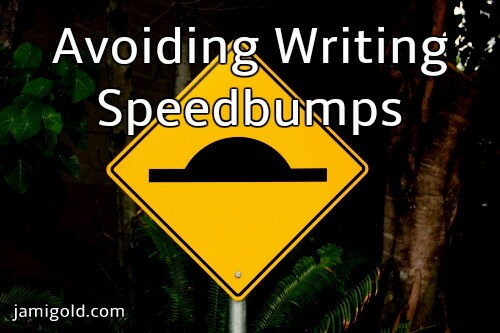 Are Speedbumps Holding Back Your Writing? Every year Romance Writers of America (RWA) holds the RITA awards, a contest for the best romances released the previous year. The awards ceremony held at the RWA Annual Conference is the Oscars of the romance-writing world, complete with a black-tie dress code. I’m once again judging for the RITA awards this year, and I’ve been blessed with a great selection of books in my judging packet. Every one of them has been at least very good if not perfection, and they’re all great examples of this genre I love. Several of these books have just minor problems preventing me from awarding a perfect score. The experience got me thinking about some of the small issues that might hold back our work from being as good—or as great—as it could be. On some level, keeping readers immersed in the story should be our number one writing goal. Each time the reader is reminded that they’re reading a book—for whatever reason—we’re reminding them they have a choice to close the book. Obviously, major problems—everything from plot and character issues to pacing/tension or info dump issues—will prevent readers from sinking into the story. But tiny problems can prevent story immersion as well. Are speedbumps holding back your writing from greatness? Click To TweetIn that post mentioned above, I linked to Jefferson Smith’s first analysis of his “Immerse or Die” reading program. He found the most common problem that breaks his reading immersion is weak mechanics, such as spelling, missing words, grammar, etc. We all know to avoid spelling errors, but other minor issues might jar readers from the story too. Even the smallest thing can act as a speedbump. Speedbumps cause our readers to back up when confused or to look up from the page, which reminds them they’re reading words on paper or a screen and not actually living in our story world. Speedbumps break immersion. There’s almost a limitless number of things that can pull readers out of our story. But let’s take a look at the issues I came across in these very-good-to-great stories that nevertheless reminded me that I was reading words on a page. We probably all understand the potential confusion if a scene starts with unattributed dialogue. When beginning a scene, there’s no previous context to figure out who said what or why. But once a conversation gets going between characters, we still have to find the right balance. We don’t want to use too many dialogue tags or action beats—attributing every line of dialogue—if we’re writing for adults or teens because our writing might sound repetitive and stilted. Those attributions will also get in the way of using short, punchy dialogue lines for rhythm or voice. At the same time, we don’t want to go too long between attributions. Readers who get confused over which character is saying what will have to back up and reread to catch the flow of conversation again (reminding them that they are reading). “I’ll come back as soon as I can.” He kissed her cheek. More than three, and readers might lose track, especially if the dialogue itself is fairly bland (like this example) or lacking obvious perspective, voice, or characterization differences. In one of the books I judged, an unattributed exchange went on for seven paragraphs. Why do I know it was seven? Because I lost track of who was saying what, had to go back to figure it out, and then counted the paragraphs. Point made. “…And that’s why we need to consider giving Susan a raise. Obviously, we’d use this technique only for longer paragraphs that need to be split for readability, but it can still be confusing if the reader doesn’t notice those little marks are missing. (I don’t know about you, but I often don’t notice when I’m missing whole words in my writing because it’s harder to notice something that’s not there—especially two little squiggles.) So it’s usually best to use other characters’ dialogue or action, narration, or body language to interrupt with another paragraph and avoid this technique if we can. “I just think it’s really important.” She nibbled on her lip. “What do you think?” Her fingers fidgeted with the hem of her sleeve. Without clear attribution—or even with attribution that comes later in the paragraph rather than in the first sentence—readers are likely to assume that second paragraph is a different speaker. Yet because the author knows what they intend and doesn’t check their paragraph breaks, I see this issue all the time in books (including in some of the otherwise great published stories I judged). In either case, when readers are confused about who’s speaking, they often have to backtrack a few sentences or paragraphs. That need to backtrack takes them out of our story, and thus is something to avoid if we can. Grammatically, these issues aren’t necessarily breaking any rules, but editing isn’t just about following “rules.” We don’t want our words to be unintentionally confusing because that interferes with the story we’re trying to tell. Somewhat related to the first problem is the guideline that a speaker “owns” their dialogue paragraph. Just as a character’s dialogue paragraph shouldn’t include dialogue from others, we usually wouldn’t want to include action or internalization from others either. That is, in a dialogue paragraph, any action or internalization shouldn’t come from a different character. A speaker “owns” their paragraph of dialogue, and the focus should remain on them. I’ll be honest. I hated this guideline when I first came across it because I thought it led to too-short of paragraphs (blame my teachers for the “3 sentences to a paragraph” idea *smile*). Now I know better. Jenna’s actions don’t belong in Susan’s dialogue paragraph, and I’d divide those sentences into separate paragraphs (and flesh them out a bit if the single-line paragraph for Jenna bother me). Yet this is another issue that I see in books time and again, including in one of those otherwise great stories I judged. Not only can it be confusing to readers, but if we mix the focus of who the paragraph is about, we also lose the ability to use action beats to attribute dialogue. Normally, the first sentence about Susan would mean the dialogue was hers. But with Jenna’s sentence in there, that clarity is gone. Who’s the speaker of that last line of dialogue? The rule about each speaker getting their own paragraph for dialogue would mean it’s still Susan, but do we trust the author to follow that rule when they’re ignoring this guideline about ownership? Maybe not. From a plot/story perspective, the hero needed a reason to realize how much he cared about the heroine, how much he didn’t want to be without her. Okay, a million events could trigger that realization, right? In this story, the hero comes across a traffic accident and thinks about how he’d feel if it were the heroine in the car. Boom, done. That’s all we need from a story/plot perspective. Was it important to the plot whether the victim lived or died? Absolutely not. Was it important to the story? Not really. The detail wouldn’t change a thing. So technically, not revealing the result (even though months pass in the story and those minor characters who would really care show up again later) isn’t a plot hole…exactly. When things are important to our characters, they’re important to readers—even if it makes no difference plot-wise. While we may be on the hunt for plot holes in our story, we might not think about the smaller details. Does that minor character ever escape her abusive boyfriend? Does that lost dog the neighbor kid was looking for ever make it home? Does that coworker we watched get fired ever find a new job? Even if they have no bearing on the story we’re trying to tell, we might want to add a sentence or two with an updated result. If the question was important to our character, we’ve made it important to our readers. We don’t want to accidentally leave them hanging (and perhaps frustrated with our story). As a bonus, a fourth issue I frequently see—and have already written about—is mixing up cause and effect in our sentences. This speedbump messes with the flow of time and storytelling for readers, which can also make them back up and reread for clarity. The issues I mention above might seem small and nitpicky, but their size doesn’t matter if they’re pulling readers out of our story. The effect—readers are no longer immersed in our story—is the same. So we want to avoid these issues just as much as the big ones. When you feel pulled out of a book, are small issues sometimes to blame? What minor issues have pulled you out of a story? Have you run into any of these speedbumps? Can you think of other speedbumps? How do you try to avoid speedbumps in your writing? Hmm, that last one is making me think. A friend recently read my novel and wanted to know the resolution of a minor detail. Me? I didn’t care because its complete resolution is not relevant. But it bothered the reader that an open question didn’t get answered. Maybe I should just slide in the answer (which I now have to figure out, because I don’t even know for sure) to satisfy the reader. I’ve found that having my husband read the book aloud is a great way to check for things like dialogue tags – because if they aren’t clear, he doesn’t know what voice to use! It’s surprising how many published books (some by very successful authors) fail to pass the read-aloud test. Oh, that’s a fantastic suggestion! Having someone else read at least the dialogue prevents our pre-existing knowledge from filling in the blanks. 🙂 Thanks so much for sharing! Deborah, my husband and I used to sit down and follow all the “blocking” tags — sitting, standing, moving, body shifts, etc. — for an entire scene. I know now that kind of editing should be in the final draft stage, rather than in the writing stage as I was then. It’s very annoying to me, when a character stands up, and my first thought is, “Wait, when did they sit down?”, rather than on the story itself. Yeah, that’s a real pain, isn’t it! And then you’re scanning back through the last few pages trying to figure out what you missed, and you’re completely out of the story. Changing what name you use for your characters can be confusing too – I read a book once (the first chapter of it, anyway), which referred to the main character in three or four different ways in as many paragraphs. Including as “the man” and I’m sitting there thinking what man? Who said there was a man? When did he show up? Oh – it’s MC! Unreadable. That is precisely why I had to give up one author I loved who had 3 or 4 names for each character. This author would also change location, time, POV but not tell the reader WHICH POV. Is this the POV of the good guys or the bad guys? Argh! Thanks. Poor spelling, grammar and apostrophe use will do this every time. Also crawling its. Ooh, I especially like your point on not forgetting about the minor characters!